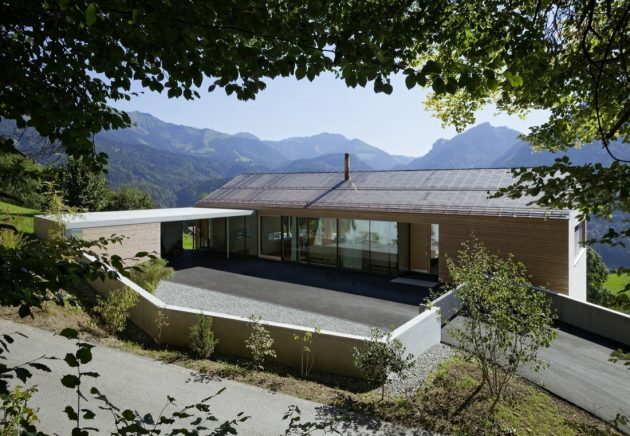 House A is a beautiful modern home situated in an Alpine village near Dornbirn, Austria. 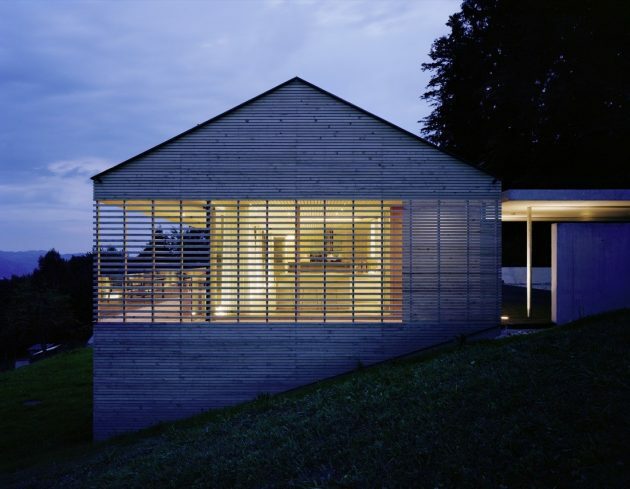 It is designed by Dietrich Untertrifaller Architekten, the studio behind the House D in Bregenz. Its pristine location gives this dwelling access to absolutely amazing views of the spectacular natural environment and the rolling hills beneath. The materials are also carefully chosen to blend the building in with its natural surroundings and make use of the panoramic vistas. Kehlegg is a hamlet just above Dornbirn, together with Ebnit and Watzenegg, it is an Alpine site among the villages that formed the city which is known today as Dornbirn. The location at the end of a winding Alpine road may have made economic conditions for the surrounding farms more difficult compared to the Rhine Valley. However, today this topography is valued as a locale with great views for private homes close to the city. 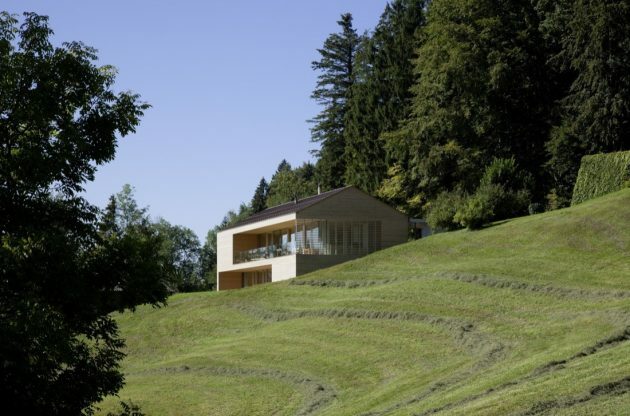 The house sits below the narrow road parallel to the hillside at the edge of a meadow that slopes down steeply to the southwest, just before the road leads from the village into the open landscape. 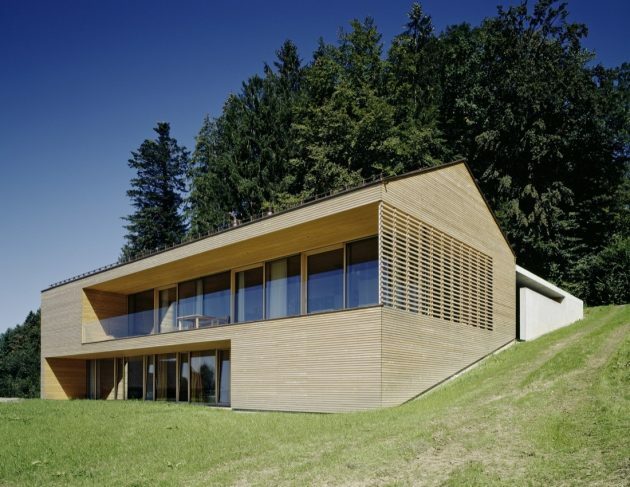 The simplicity of the building enhances its Setzung (i.e. accentuation) as a primarily architectural gesture. It forms the structure of the building, both for its interior and exterior, the polarity between the one-story street-side and the two-story valley-side façade, as well as the functional structure of the interior into a living area upstairs and the bedrooms downstairs with a view of the garden. On its road side the building frames a triangular main courtyard. 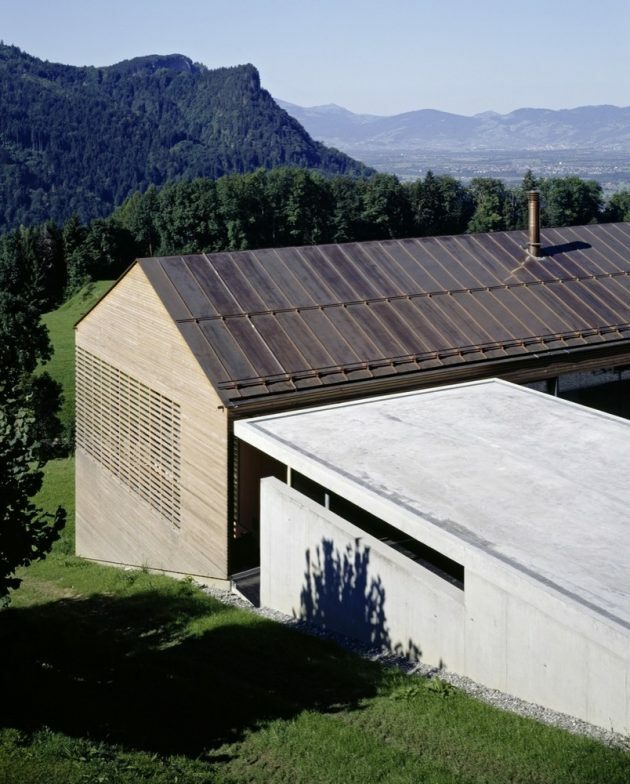 The courtyard is flanked by a flat-roof annex that runs crosswise to the ridge of the building and which distinguishes itself as an exposed concrete structure from the main building made of timber. After entering the residential unit, the entrant recognizes that the wooden façade forms only the exterior layer for the room-forming façade concept. The screen composed of horizontal silver fir slats gives the building a uniform appearance by framing a ring of terraces and exterior staircases. 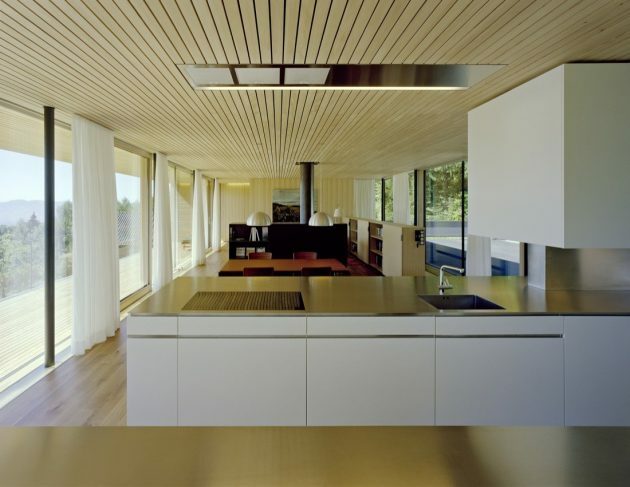 It superposes with interior, room-height glass and wood panels. 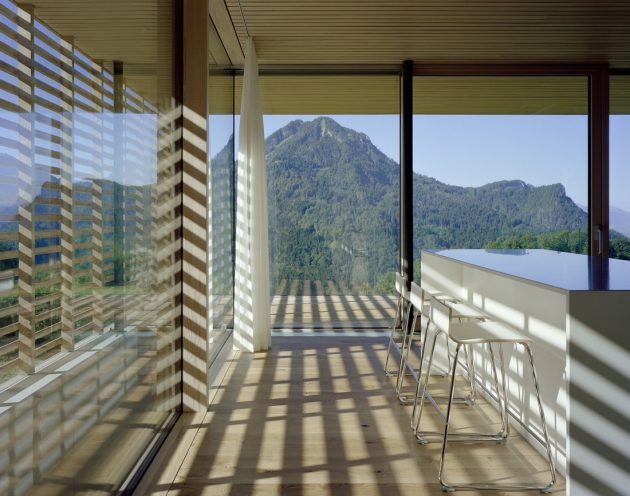 The result is a spectrum of graduated transparency of light and views protecting the rooms according to the needed level of intimacy from views, while offering vistas of the valley and the Rappenloch schlucht, a ravine, to enhance the living environment.